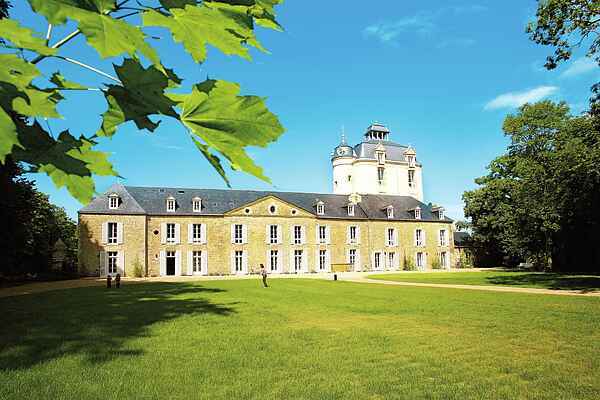 You'll be staying at the Château de Keravéon, an imposing, late 18th century residence which dominates its 10 hectare estate. The castle, with its beautiful watchtower, is visible from far off and the entire complex is nearly the definition of a historic monument. On this beautiful property, you'll rest easy and the children can play in the fenced, heated swimming pool. Take advantage of the sandy beaches of Erdeven (4 km) and explore the wild dunes, forests, and, of course, historic megaliths of South Brittany. The magnificent Ria d'Etel (3 km) is one of the loveliest places in Morbihan. The charming hamlet of Saint-Cado (5 km), with its fishing homes and Roman chapel, is also a must-see. Erdeven has a bakery, supermarket, and restaurant (1.5 km). And there's an 18 hole golf course in Ploemel (3 km). Even more golf courses in Baden, Ploemeur, and Queven. The Quiberon peninsula (15 km), with its characteristic Breton villages, emerald green sea, and untamed landscape, is worth the trip. In Carnac (9 km), you can marvel at the age-old menhirs. In the lively fishing town of La Trinité-sur-Mer (13 km), you'll find many great restaurants and shops. The medieval city of Auray (15 km) is practically a painting.